Less than 24 months ago I plunged into the business world of aging when my husband, David, and I purchased a small publication called The Senior Guidebook as a semi-retirement business. At 59 I was starting to think about my own aging (and about my parent’s—they are in their 80’s) but I didn’t dwell on it. Like most Boomers I was in denial about what getting older really meant; retirement communities, nursing homes, getting sick, caregiving, and ageism weren’t on my radar. Besides, I was going to grow old gracefully and stay in my waterfront home (with a bazillion stairs) ‘til I died, wasn’t I? 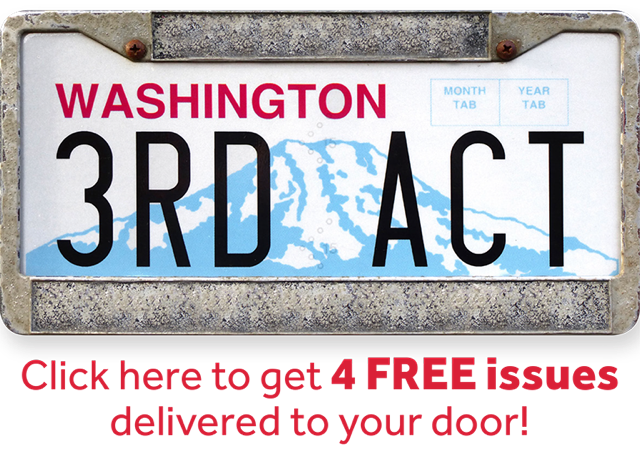 Launching 3rd Act Magazine in April 2016 changed all that. I discovered that most of my beliefs and expectations around aging were wrong, and that there is much I can and should do to insure a better old age. Planning for inevitable changes as I grow older is essential. Aging with my eyes open will help insure a happier and more confident third act, with me more in control of my future life—and death. And this is true for everyone. I gain new insights every day and will use this space to share my thoughts with you. I’m looking forward to getting to know each other as we all head down this path together. Thank you for sharing this journey with me. New adventures await! I am so excited about this new concept (to me) “The 3rd Act”. I first heard it on Ted Talk with Jane Fonda. I am almost 57, amazingly and excitingly starting to think about my 3rd Act. There is still so much living to do. Thank you for sharing your excitement, Tammy. I am glad that you are enthused about this stage of life and that our magazine is a good resource for you. We will travel this aging journey together! I will ever be the same! In a good way!